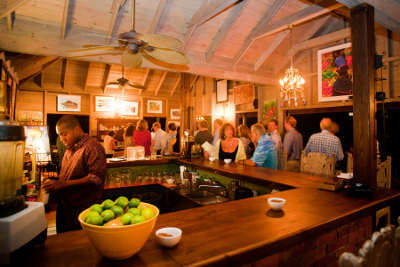 Hidden up high in historic Hamilton Estate, Bananas offers an authentic Caribbean experience for your guests. Our impressive plantation style house is eclectically furnished and decorated with vibrant colors and set amongst an acre of lush green gardens with views over the Caribbean Sea and Nevis Peak. Our wrap around veranda and covered gazebos ensure that all your guests have the al fresco dining experience. Exotic cocktails prepared with flair from an extensive list by our professional barman can be enjoyed on our rooftop terrace, which has magnificent sunset views. It is also the perfect spot to enjoy one of our aged rums or Cuban cigars. At Bananas we believe in “fun dining,” not fine dining, however we are serious foodies. New for the 2017-2018 season we will specialize in delicious seafood dishes and an expanded selection of vegetarian and vegan options to meet an increased demand for ethical and healthy food. Bananas is featuring more fresh, local seafood and produce than ever before. The menu is a fusion of Caribbean and International cuisines and is prepared by a team of talented local ladies. Our selection of original Caribbean art and our Boutique filled with stunning fashion and gifts curated by the owner during her travels around the world make Bananas more than just a dining experience. Pricing available upon request. Please note, there is no additional venue charge, although groups less than 25 persons wishing to have a private experience must meet our minimum food and beverage spend of $4000 USD. We strongly recommend that you plan your event with an arrival time prior to sunset in order to best take advantage of our amazing views and gardens. Bananas is able to fit the bill no matter what the occasion, should it be a seated formal dinner or luncheon, a Caribbean themed buffet, or a sophisticated cocktail party with canapés and food stations. It is perfect for birthdays, weddings, and celebrations of any kind. We are fully confident that each of your guests will receive the full Bananas experience.